Let's try mc.applenova.com one more time now. Does this mean some of the work done on Applenova.com today was invalidated? Nope, everything was accounted for. Last edited by Elysium : 2011-03-26 at 22:48. No, Brad took a snapshot from the server before anyone else could change stuff and moved it. 709 was the only one playing on the AN proper server at the time. Once we got Lenny running Brad moved it. What you had when you last logged in is there and work where it was when you left. Yeah, he's sitting on my utility room fridge. The router on the top left is the firewall/router for my home now. Nevermind that crappy Verizon modem, it's never been used but the tech said I had to have it so there it sits unplugged and not connected to anything. Behind the monitor are some TM backup drives. The UPS on Lenny is 1500V and currently shows a 64 minute run time for Lenny. There's a gigabit switch and a Time Capsule on the shelf with a Vonage phone adapter on the wall. The power strip is so I can reset my TC and HDDs with the flip of the switch or unplug individual units. My router is providing QoS so that my phone adapter gets first priority followed by Lenny and then the switch the branches out for the rest of the house. Phone adapter is only rated to take about 128kb max. This means that that it's all coming out of my home and things are running great. I have 25Mb/25Mb FiOS and it's holding steady. A few of us have been playing and there's been no lag and no issues that I'm aware of. CPU load and capacity are good! Yeah! I love having a supportive wife. Those Grey and Blue cables that go across the screen are killing me. Don't let Robo see them, his head would likely explode. Yeah, I'm making it pretty now. Actually, last night I added an UPS for the router and FiOS ONT as well as replaced those cables. 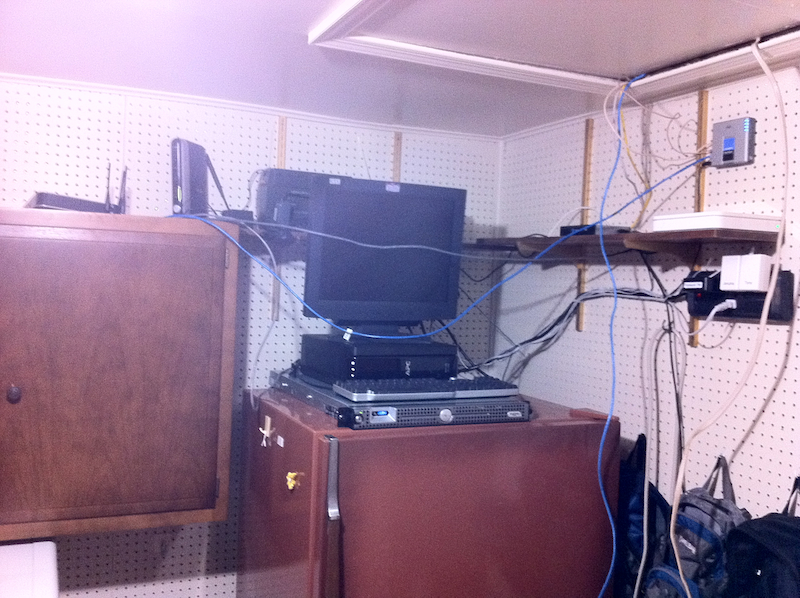 I added a KVM and my Mini Media server to the shelves too. So I'll post an updated pick in the next day or so. It's looking better, though there are still tons of wires up there! Nice pics guys. Thanks for sharing those. Shitfuck. Don't update your client until the server software is updated! Learn from my mistakes. I'll update the server later tonight. Well, I'm looking to get a new CPU to beef this thing up. Looks like the cost is about $200 for a good 3.3GHz Xeon to go in this server. Interestingly enough, it's an odd socket, LGA771 rather than LGA775. Just one way to make the chips and support products cost more for commercial products. Since RAM is good on this system but the CPU is the bottleneck it's what I'm going to focus on getting beefed up. I don't know when I'm going to be able to do this update though because I've just quit my job. On the flip side I will be starting a new one, but am going to be taking some time off in between. So I don't know how fast I'll get the cash together to get the chip. It is in my plans though. So for those wondering, I'm looking at this dual core Xeon. Sure it's only a dual, but the 3.3GHz on a single core is likely better that 2.33GHz on a quad for the pice. That is since MineCraft only uses one core right now. Down the line it seems like this would be a better fit anyway for the price and since Lenny is pretty much gonna stay and MC server for the foreseeable future. Would you agree that the higher clock rate would serve better than the quad core? Good call. Minecraft would definitely benefit more from a faster clock versus more cores. Tonight I've restarted the server with a few arguments to change some of the JVM's default behaviors. I'm also considering installing one of the prerelease Java 7 builds since Java 7 reportedly has significant performance optimizations over Java 6 in some core bits like string, array, and arithmetical operations. I still wouldn't purchase the new CPU just yet. Let's give these options (and maybe Java 7) a try over the weekend first before dropping some cash. Your edits last night really seem to be helping the server Brad. Makes holding off on upgrade much easier. Thanks. Uh, turtle? Everything ok over there? I can't get to the server, even via SSH. My router had to reboot earlier and it ended up getting a new IP but DynDNS updated. Can you not get in still? Edit: Figured out the issue. Seems when my router rebooted earlier it was assigned a new IP address. DynDNS to the rescue right....nope. Seems it only updated one of my hostnames. This prevented anyone from getting the update. Sorry about that. I've fixed the glitch and this won't be a problem again. Last edited by turtle : 2011-04-01 at 20:10. Connection times out for me too. Tripping on the power cord again? I have some money floating around that I would like to send towards the processor upgrade. Consider it a gift for providing such an awesome server/service. I have just made a donation towards a new processor for the server at Turtle's donation site (this link was provided by turtle: https://www.paypal.com/cgi-bin/websc...=XYAUF9YE45BPC ) of $30. In the spirit of contributing towards the processor, I will match further donations by others up to an additional $30, if needed to cover costs. In for $30 as well. I wouldn't have the remotest clue as to how much a processor is since I've never delved into that sort of thing. What are we looking at as far as cost? This will cut down on the lag I presume? $30 in the pot from me. Actually CAD$29.56. Hooray for strong Canadian dollar! Guys, thank you very much for chipping in on the processor. I really do appreciate the donations to it. billybobsky, 709 and Bryson have really made my night. Mrs T and I are very grateful for the support in getting the upgrade. Mostly because we all enjoy the game and I hate the idea of it not being able to handle our normal player load. 100% worth it. And then some. To address Keiran's point from earlier: is it worth having a subforum here (maybe even hidden from those who aren't interested) for Minecraft? This thread is unwieldy indeed.